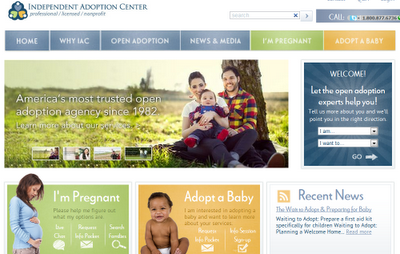 Homepage for the Independent Adoption Center. The woman is having relationship problems/does not want to be a single mother. It seems adoption would largely (albeit not wholly) mitigate these potential problems for women with unplanned pregnancies. However some women believe that, after having carried their child for nine months, adoption would be very emotionally painful. Some women fear the idea of "always wondering"--wondering how the child is developing, how the adoptive family is treating the child, and whether the child wonders about her mother. Birthparents in open adoptions typically demonstrate positive self-esteem related to responsible decision making and feeling in control of their life -- making a plan for the baby, instead of abandoning him/her. Birthparents with open adoptions work through the normal feelings of grief much more quickly and easily. While open adoption does not solve all the problems of unplanned pregnancy, it is a type of family structure that may make it more plausible for a woman to give life without wreaking havoc on her own. As a birthmother, I strongly advocate for open adoption. IAC offers some great information! I'd also suggest checking out www.AdoptionCouncil.org for information regarding adoption and foster care. I love that pro-lifers are learning more about adoption and spreading the message. But I do hope that we don't start to play down the difficulty of adoption - doing so could make prospective birthparents uneasy as they know it's intellectually dishonest to assert otherwise. Amanda, would you be interested in writing a guest blog post about your experiences with adoption? While I am generally in favor of open adoptions, I think there are some cases where it causes trauma to all involved. So I think this is something that should be determined on a case-by-case basis.